Drained savings, mounting credit card debt, and lack of the essentials, government workers described what it’s like missing a paycheck with no hope they’ll get paid anytime soon. Some of the hardest hit workers are TSA agents. Depending on where agents work the average pay is $35,000 per year. “They’ve just always been a part of the community,” Matthew Trizis said. Trizis works at the family business, Country Skillet, on Roosevelt Boulevard in Clearwater. Along with his mom and dad, Trizis is giving back to the community that’s supported their restaurant for nearly 40 years. A TSA agent who asked not to be identified told ABC Action News reporter Michael Paluska he’s eaten at the Country Skillet since he was 2 years old. Trizis is just one person of many across Tampa Bay helping to feed federal employees suffering through the shutdown. 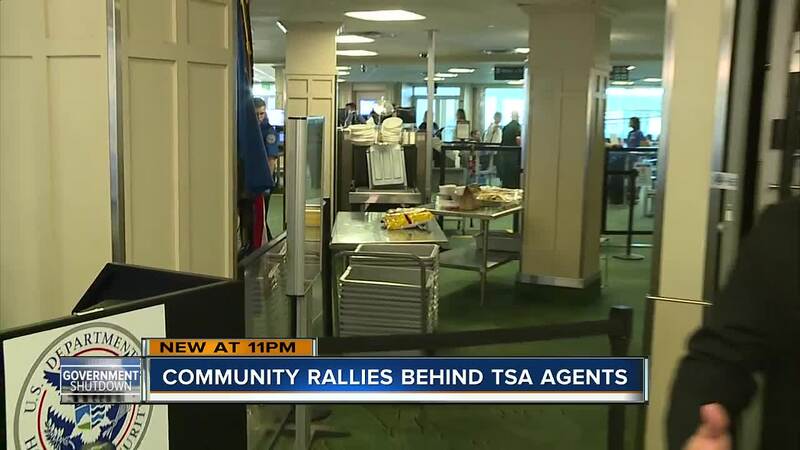 The Tampa airport was one of the first in the country to offer assistance to federal workers. Officials teamed up with United Way Suncoast and Feeding Tampa Bay to start a food bank and donation center. The need is so great, Emily Nipps, a spokesperson for Tampa International Airport said they are extending the program until next Friday and now include employees at St. Pete-Clearwater. That brings the total number of employees they are helping at the Coast Guard, FAA, and TSA to nearly 1,300. If you'd like to help provide relief to the government workers affected by the shutdown, donations can be made to United Way Suncoast and/or Feeding Tampa Bay . “Thank you, we appreciate you and everything,” a TSA agent told Trizis. After a firm handshake and a wave goodbye Trizis was in his car heading back to work. As the shutdown drags, Trizis hopes he inspires others to help and knows this won’t be his last delivery. Airport officials said federal employees could pick up donated items and food at the Tampa airport at 5020 N. Westshore Boulevard. Nipps said there is a considerable need for the basics that include, toothpaste, diapers, and baby wipes. While many airports across the country are experiencing a record number of sick call outs, Tampa airport officials say they have not closed any terminals, and they are not experiencing long wait times: a testament they believe is due to the support system the Bay Area has put into place. Despite the staffing shortages, TSA has strongly denied any effect on aviation safety. Agency leadership has stressed the country's airports and airlines would not be imperiled by any hit to security operations, citing strict standards and a program that sends screeners and managers from airports under less stressful circumstances to any airport needing backup.